When I went into the dwellings of the Bete Israel I saw a number of things that almost all of them had for in their “kitchen” area; two burners, one gas and one coal, a tea pot in which to boil water, a clay coffee pot in which to steep coffee, a small pan with lid that “whet” is cooked and stored in, a cabinet, a plastic coffee tray that holds small coffee cups, several large , lidded plastic buckets for storing (and catching when it rains) water, a large plastic bowl and cup for washing of hands, and 2 ingera baskets, one for fermenting dough and one for baked ingera. This is a typical “kitchen area”. In the middle are the two “stoves” that everyone has, a gas burner and a coal burner, on top of the coal burner is the “whet” pan, staying warm for the next meal. A little to the left is the tea pot, used for morning and afternoon tea snack. Behind the burners is a typical cabinet and to the left of that is an ingera basket with ingera dough fermenting in it. To the right of the cabinet is an ingera basket with ready to eat ingera in it. The Pringles can was where they stored the coffee in this home. The diet of the Bete Israel is very simple. It consists of mainly “ingera”, “whet” and tea. My topic next week will describe these in a little more detail. 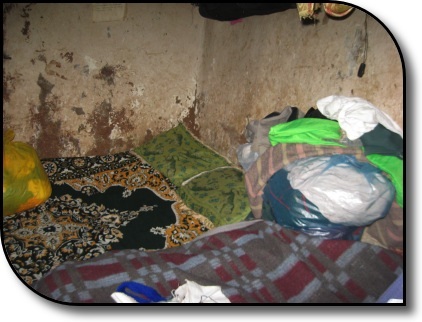 Today I will talk about the living conditions of the Bete Israel, specifically their dwellings. 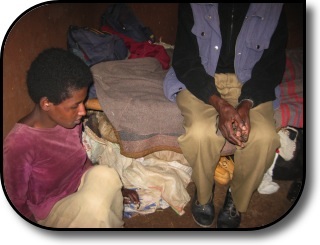 There are two distinct Jewish communities in Addis Ababa, I lived among the Bete Israel community (for more information about the two communities see the About the Estranged link above). 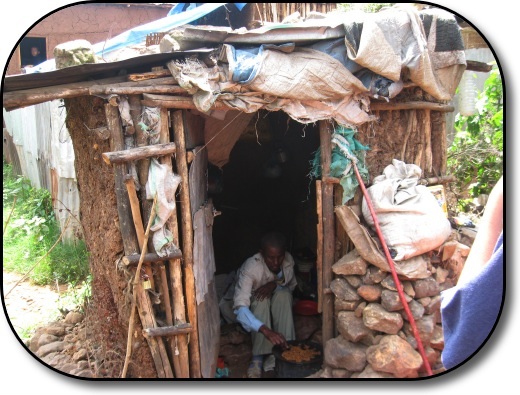 This community is disbursed among a very poor section of Addis that is close to the Israeli Embassy. The people moved close to the Embassy because their sole reason for moving to Addis was the belief that they would soon be moving to Israel. Some have been waiting in dire living conditions for up to 12 years to go to Israel. 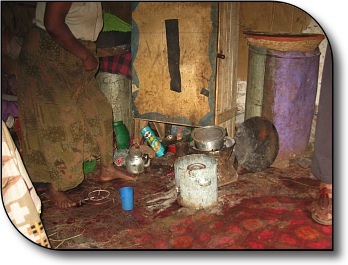 Their dwelling places can hardly be called homes, most live in one room structures that are shared by 4 to 12 people. Each dwelling has two beds, set perpendicular to each other against the walls. 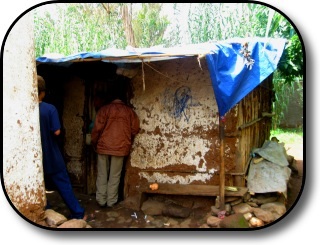 bathrooms, appliances, nor running water in these “homes”. I will discuss how they manage without these things in future reflections.